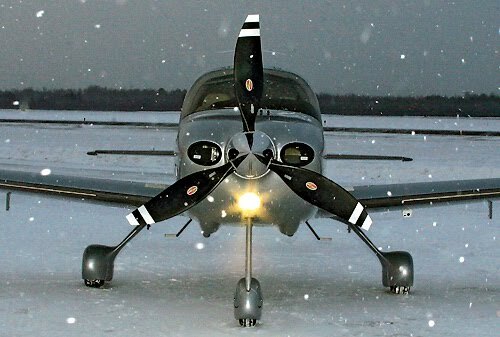 With winter just around the corner, it is time to review winter operations. A cold engine does not want to start, and if you DO get it started using incorrect procedures, you’ll hurt it. Cold starts done wrong are really hard on the engine, the starter motor, and the battery (they are usually equally hard on the airman’s ego, but that’s another issue). After more than a quarter-century experience starting airplanes in temperatures down where Fahrenheit and Celsius coincide, I think I have some pretty good insights. Let me help you avoid the embarrassment and inconvenience of an unsuccessful cold start, while at the same time saving wear and tear on the engines. This process, keeping the engine warm rather than getting it warm, is better for the engine overall and reduces the risk of grinding the starter or running the battery down the morning of the flight. Hot air rises. Put the heat source as low in the engine compartment as possible, and as near the oil pan as possible. As the hot air goes up through the engine compartment it will warm everything. If the heat source must be inserted high in the engine compartment, the preheat will be less efficient, will take longer, and the oil will never really get as warm as desired. So give yourself more time. If overnight heating is not possible, upon arriving at the airport, set up the preheater before you do anything else. How long should you preheat? Depends: Depends on the type of heater, the overnight temperatures, and the airplane. You will learn from experience. If overnight temperatures have been sub-freezing, the engine is cold-soaked and needs a good long preheat. Half an hour or more. You need to heat both the oil and the engine. If the aircraft configuration does not allow inserting the heater hose low in the engine compartment and you have to come in through the nose, an hour is better. We have two electric preheaters at Aerowood, and one propane heater. The electric heaters are safe, effective, simple. The propane heater, however, is a different story. Do not attempt to use the propane heater without a thorough checkout: you could singe your eyebrows or destroy the airplane. Before you untie and unchock the airplane, double-check that all switches are off, throttle closed, mixture lean. Then pull the propeller through several times: five or six blades will loosen congealed oil and pull fresh, hopefully warm oil up into the “innards”, thus making the start much easier on the engine, the starter motor, the battery, and the pilot. Leave the preheater on during your preflight briefing and walkaround (unless it’s the propane heater). PRIME: A cold engine needs lots of fuel. Give it four or five shots of prime. The normal two or three is not adequate. Then pump the throttle two or three times, turn the BATTERY side of the Master on, and hit the starter. Some have expressed a fear of fire if they overprime the engine. I have never experienced a fire during startup using the procedure just outlined. Never. I have, however, frequently observed pilots run the battery down, in the process significantly increasing wear and tear on the starter motor, because they did not prime adequately. A cold aircraft engine needs lots of fuel or it will not start! After the engine starts, adjust power to 800-1000 rpm, turn on the Alternator side of the Master, and proceed with your piloting chores. Go flying. Since coming to Monroe, I observe almost daily a pilot sitting at the tiedown, setting radios, briefing passengers, doing all that preliminary stuff we’ve gotta do before a flight, with the engine at 1200-1500 rpm. If it’s really cold you may need this much for a few seconds, but once the engine is stabilized bring it down to under 1000. You’re hurting the engine sitting there taking care of your preliminaries with the engine more than 1000 RPM. You’re also hurting the brakes, which you’re dragging all the way down Taxiway Alfa with that much power. I discussed this with our maintenance staff to see if I’m missing something. They agree: these cold start procedures will save lots of maintenance, and the tendency to sit at the tiedown with rpm above 1000 is a Monroe distinctive, it is wrong, and it hurts the engine. Don’t do it.